Almonds, Peanuts, Cashews, Blueberries, Chocolate Chips & More! It's All In The Mix! Do you like raw, roasted, savoury and spicy nuts, fruit and seeds? Are you looking for the ultimate party snack kit? It's time to stop wasting your money on stale and low-quality nuts and invest in the most delicious, fresh and all-in-one mixed nuts and seeds pack! Presenting The Veratify Ultimate Mixed Nuts, Fruit & Seeds Party Snack Pack! This all-inclusive nuts gift bag contains 26 individual, air-tight packets of crunchy delights for you and your loved ones to enjoy! Not only are our natural nuts and seeds fresh and mouth-watering, but they are also convenient! All you have to do is pop one packet and let the fun begin! Don't Hesitate! Indulge Yourself! Fresh, Crispy & Protein-Packed Delights! You can now enjoy the freshness, crunchiness and delicious flavour of hand-picked almonds, peanuts, cashews, blueberries, chocolate chip cookies and many more with the Veratify elite snack kit! This all-in-one gift set is perfect for movie nights, sports games, picnics, road trips, camping trips, children's parties, office breaks, meetings, cocktail nights or just a lazy Sunday afternoon with your favourite drink! And the best part? This mixed nut set contains. DISCOVER THE ULTIMATE HEALTHY MIXED NUTS PARTY SET! - If you like healthy, crunchy and mouth-watering nuts and seeds, then you will absolutely love this all-inclusive mixed nuts gift pack by Veratify! ONE SNACK KIT, 26 DIFFERENT EXPERIENCES! - Are you always looking to explore new flavours? The Veratify comprehensive mixed nuts party pack includes 26 different, individually sealed, nuts and seeds varieties for you to enjoy! Whether you like raw, unsalted, roasted, spicy or salty nuts, we've got you covered! THE IDEAL SNACK FOR EVERY OCCASION! - Our nutritional and protein-packed mixed nuts and seeds are the perfect snack for any occasion! Just pop the packets and make your movie night, sports night, party, office break, picnic, camping trip, road trip or business meeting fun and crunchy! SEALED FRESHNESS IN EVERY SINGLE PACKET! 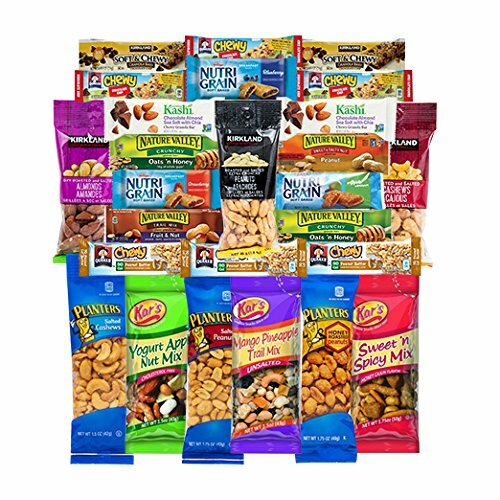 - You will never find a stale product in our mixed nuts and seeds gift basket, since each item is individually packed and sealed for maximum convenience, freshness and crunchiness! And the best part? Since they come in handy packets, you don't have to eat them all at once! ARE YOU READY FOR A SNACK-ATTACK? - The Veratify healthy mixed nuts and seeds snack kit is the perfect gift for any housewarming, retirement, anniversary or birthday party! Plus, it comes with our hassle-free, full refund guarantee, so enjoy it 100% risk-free! What are you waiting for?